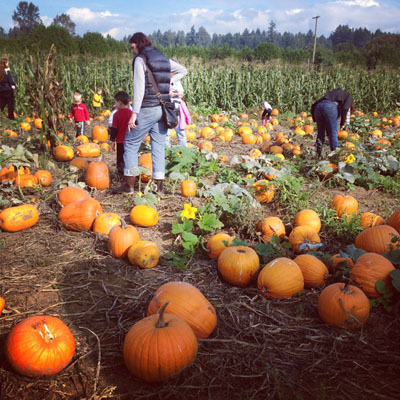 Here is a list of some of the greatest pumpkin patches that you and your family can visit in the Lower Mainland. Take advantage of this beautiful BC Fall weather (besides this weekend), throw on some gumboots, and get ready to pick out the best pumpkin in the patch! At the Applebarn Pumpkin Patch in Abbotsford, you can spend the day with family, ride the Tractor Trail, jump on the Pumpkin Pillow, and even ride a zip line! Don’t forget to pick your pumpkin, pet the animals at the petting zoo, and even check out the bee hive through the bee viewing window. The Applebarn truly has something for everyone! When you visit this wonderful Langley pumpkin patch, you can take a hayride and check out the farm animals. Be sure to stop by on November 1st where all the leftover and unused pumpkins are given to the cows for the annual pumpkin patch stomp! When you head out to Chilliwack to visit Petey’s Pumpkin Patch, you’ll find over 5000 sq. of indoor activities, including a train and a wagon that operate rain or shine! A new addition this year is the Guerilla Q authentic Southern style BBQ Ribs, brisket, pulled pork and more, so come hungry! Admission is $8 per person or $25 for a family of 4 (2 adults and 2 kids). The Laity Pumpkin Patch is a family-run patch for 25 years, and their 18 acres is full of magical fairies, gnomes and even dinosaurs! You can even visit Frontier Town and try your luck panning for gold. A petting zoo, corn maze and a tractor wagon ride are a few of many attractions at this wonderful pumpkin patch. Not only a pumpkin patch, but a working farm that grows and sells a variety of fruits and vegetables. Get ready for some sing-along hayrides, a corn maze and don’t forget to pick out a pumpkin to take home! Parents – there is also a winery on-site if you’re so inclined to try a tasting!